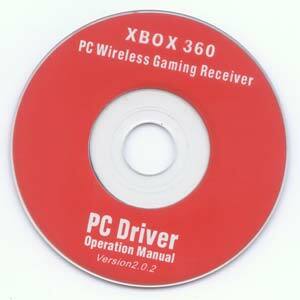 Here’s a tutorial on how to get your Xbox 360 wireless receiver working for XP. This tutorial will teach you on how to get the Xbox 360 wireless receiver working inside of windows XP. Unlike the china drivers which make you run a setup file and have a lot of unnecessary bloat. This tutorial will be using the official Microsoft drivers with a slight modification to the INF file. This modification is necessary so that windows XP can pick up the driver right away. Lets begin. Now for those who don’t know what this little guy does; It allows you to hook up ANY wireless Xbox 360 Controller which operates on a wireless 2.4ghz range to your PC (Up to four devices just like the original Xbox 360) which is useful for playing a lot of Steam games which are coming out which are all about Couch-Action multiplayer action. This wireless receiver is actually a really nice device to have considering Xbox One is released making the hardware of the 360 obsolete. And when hardware becomes obsolete it gets very cheap! I personally paid for 4 Xbox 360 controllers on eBay for around $55 with shipping included. Which isn’t bad at all! Read on if you would like to know more about this little $8 unit! This is a brief summary and differences between the two Xbox 360 receivers that you will find out on the internet. 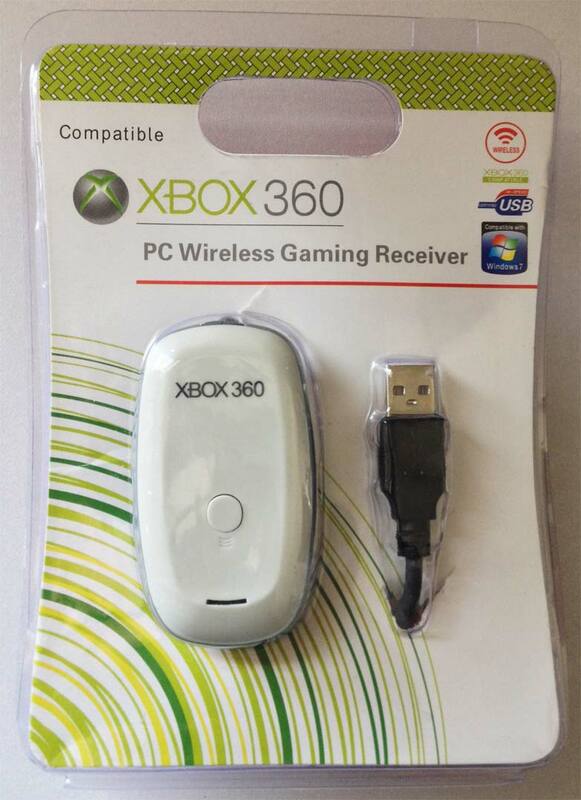 This is the official Microsoft Xbox 360 Wireless Receiver. Note the Microsoft Logo on the casing and the tab on Cable. I should note it is next to impossible to find an OEM Microsoft 360 Wireless Receiver unless you are willing to fork out $50-60 for a controller and receiver pack. Used game stores such as GameStop will not keep these around and often will not even have a receiver. GameStop treats odd-ball hardware devices by only offering a few pennies to buy it off of someone. When you do official receivers show up on eBay. they are typically going anywhere from $15-20 dollars because they are no longer in production thanks to the Xbox One. 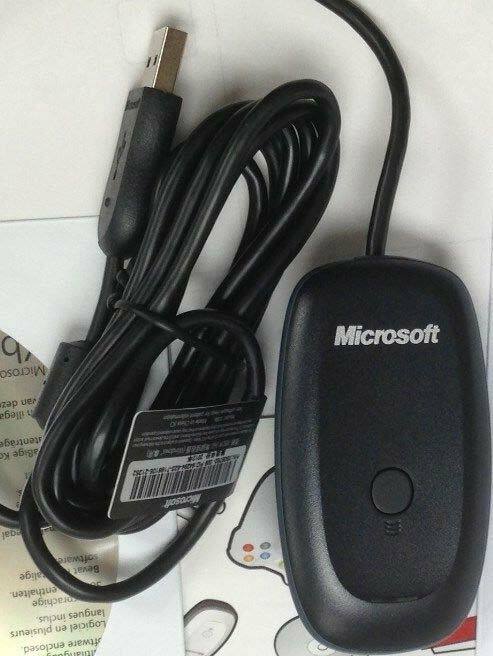 This is the Chinese Xbox 360 Wireless Receiver with has no indication it came from Microsoft. Chinese receivers will come in cheaper packing (if any at all) and will not say the word “Microsoft” anywhere on the unit or package. This allows them to sell this units in this country without them getting pulled for various intellectual property related laws (And don’t think Microsoft won’t go after people for this! They still throw cease and desist letters to people giving out MS-DOS disks for gods sake!) You’ll also get a CD and that’s about it! No real instructions in the packaging itself. for windows XP/7 or USB\VID_05C6&PID_9244 for windows 10. Where to purchase the China Wireless Xbox Receiver. Ebay – Ignore the Malaysian listings as it generally takes three times longer then China and the sellers use dirty tactics to get the lowest price. Generally 8 to 10 dollars USD with shipping from China. NewEgg – More for North American buyers who don’t want to mess with Ebay. Prices are 9 to 13 USD plus possible shipping. DX – A little more expensive then Ebay in the 12 to 14 USD range. DX however may be more suitable for international buyers. Alibaba – This auction site initially was not friendly to US buyers with Paypal. But they are about as good as Ebay. I would only suggest this site for people that are looking for bulk purchases of the third party receiver. Note: Zero commission is made from these links. These are posted as a service to those reading this blog. Lets go through some of the issues encountered with the Chinese Wireless receiver. Under Windows XP this CD may be helpful but it’s kind of bloated. Unlike the previous blog articles dealing with windows 7 and windows 10 the drivers included on this CD-Disc may be of use to you. In case your receiver did not come with one of these CD’s. Or the CD was cracked due to shipping from china like a few of ours were. I will provide a link for downloading the image for those who are interested. The overall size of the archive is about 50mb and that’s due to a lot of blatantly redundant files such as Direct X drivers. Click here to download the original CD that came with the receiver. This was only uploaded for archival purposes and will not be used in any way during this tutorial. Download the driver we will be using for this tutorial. This archive which is approximately 5Mb in size contains both the 32-bit and 64-bit versions of the Xbox 360 receiver driver. Click here to download the archive or click on the icon to the right of this paragraph to begin. Xbox360_32Eng – This is the 32 bit version of the Xbox Driver for those working with Windows 7 32-bit, Windows 8 32-bit, and finally windows 10 32-bit. Xbox360_64Eng – This is the 64 bit version of the Xbox Driver for those working with Windows 7 64-bit, Windows 8 64-bit, and finally windows 10 64-bit. Xbox360_Mod_XP – This version is made specifically for windows XP 32/64 bit and Windows 7 32/64. Windows XP Tutorial listed here. This entry was placed into the .inf so that Windows XP can properly identify the Xbox receiver. 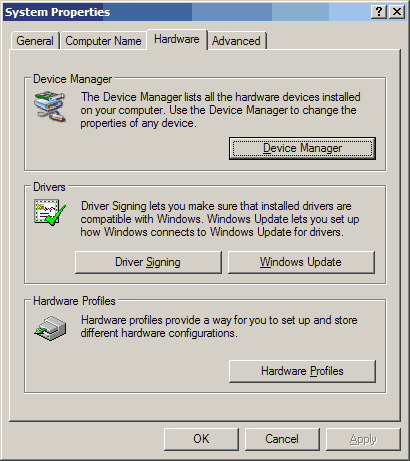 Unlike later operating systems windows XP does not give us the option to force a particular device driver. Even if we attempt to look for the driver manually. 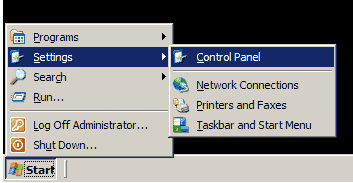 By adding the vendor and product ID’s into the .inf file we ensure that windows XP will find everything it needs. 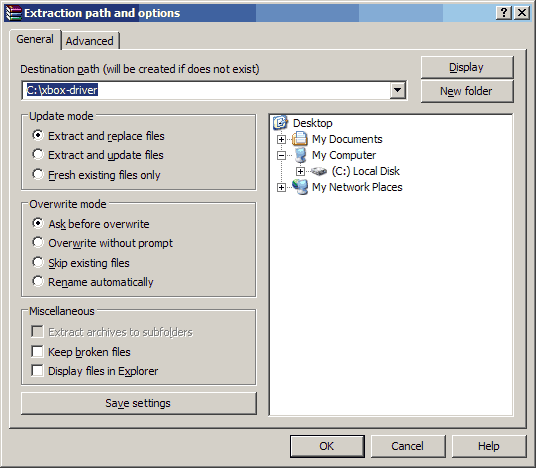 Extract the zip file using your favorite application for handling zip/7-zip files. We like to use WinRar. Make sure that you remember where you have extracted the files as it will be important when device manager asks us. In this example we will extract to C:\xbox-driver\ . Lets begin installing the driver. The first thing we are going to do is we want to open up our device manager before plugging anything in! There’s many ways to do it but lets go with the most consistent way which is click on the start button, then settings, and control panel. Scroll down until you can find system properties and click on it. 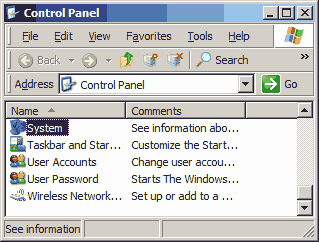 Inside of the system properties window you can click on the hardware tab. 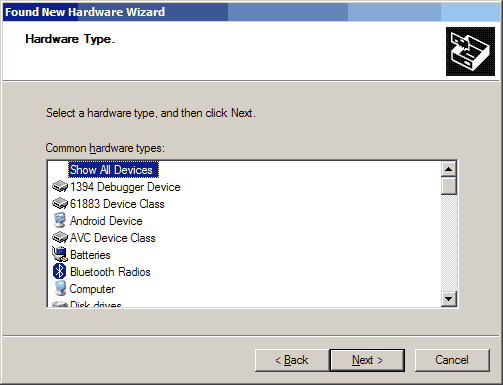 And finally click on the Device Manager button. 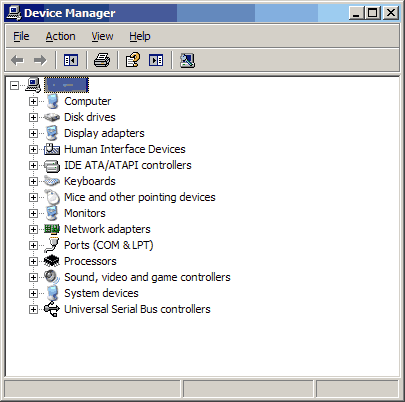 Now that we got the device manager open the picture above should be an estimated screenshot of what your system should look like with unknown devices and all of the drivers installed onto your PC. We have to stress this because users would have multiple devices not installed and may fail to diagnose the correct device we are installing. You may now plug in your xbox receiver into an open USB port! 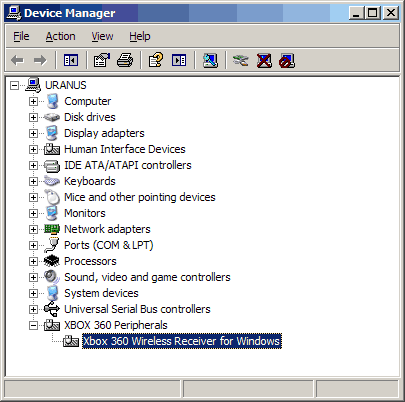 Upon plugging in your receiver your device manager should come to life and begin detecting what kind of device it is. 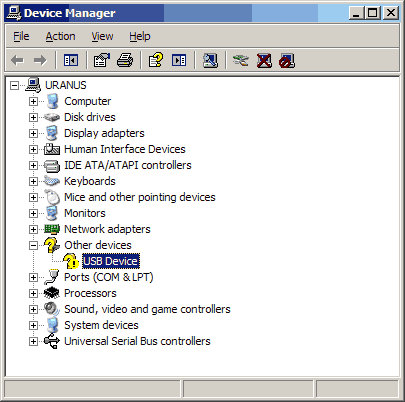 It will not find a driver right away and will list it as a “USB Device” and give it a yellow exclamation point indicating that no drivers have been installed. This is good. 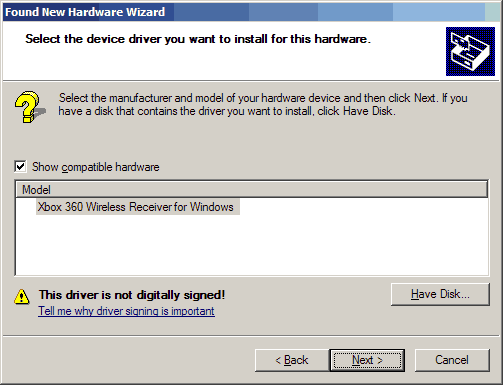 Xbox 360 receiver device verification. To verify that this is our Xbox 360 receiver from china. Right-Click the “USB Device” and click on properties. Click on the details tab and select “Hardware Ids” from the selector box. It should read something similar to the picture above with USB\VID_045E&Pid_0291. On 02/01/16 – We had one of the Chinese wireless receivers die on me after a years worth of service bouncing back and forth between devices. This can even happen to a Microsoft OEM Receiver as the only thing that is really inside your dongle is a microchip and that’s it. The Chinese versions don’t even have a fuse along the 5 volt power lines and in my case the regulator that reduces voltage from 5.0vdc to 3.3vdc for the chip to use was totally fried out. 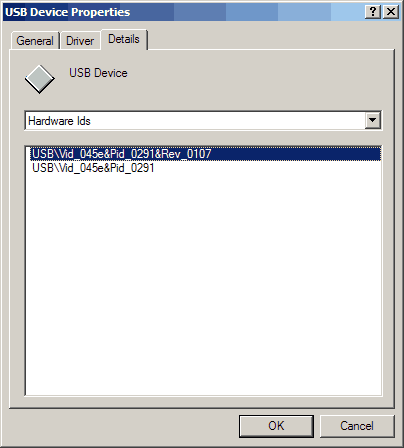 A dead give away that the receiver died on me is by pulling up the Hardware ID in device manager underneath the properties of the USB device and it will display USB\VID_0000&PID_0000 or USB\VID_???? depending on operating system. If you have something similar to this then contact your vendor right away and ask for a refund or another unit as your USB receiver is dead and not giving an ID. Now that we have verified that our Xbox 360 receiver is transmitting the correct hardware ID. We can proceed with installing the driver. 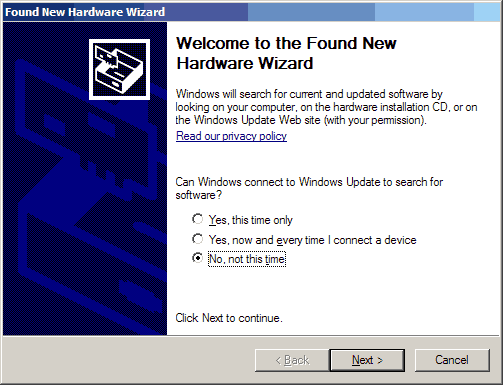 This wizard automatically comes up if you have the plug-n-play service enabled on windows XP and default policies. But in case you are running windows embedded so that you can still get updates for your old XP box. 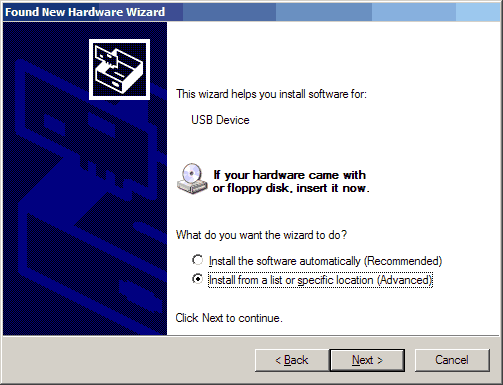 You can activate this wizard by clicking on the “USB Device” in your device manager, and click on “Update Driver” to begin. We are going to specify our location since installing automatically will not work. Click “Install from a list of specific location.” And then click next to continue. We could include the folder we want to search and be done with it. But we’re going to be exact about getting the right driver. Select “Dont search. I will choose the driver to install.” and click next to continue. Click “Show All Devices” and click next to continue. We ar not going to choose anything as the driver has not been loaded yet. 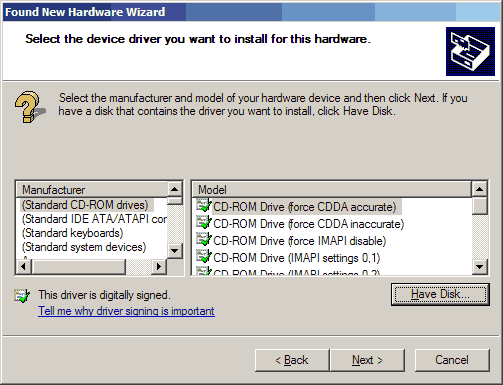 Click the “Have Disk….” Icon and click the next button to continue. We are going to point the disk to the folder where we just extracted everything that you have downloaded from this page. 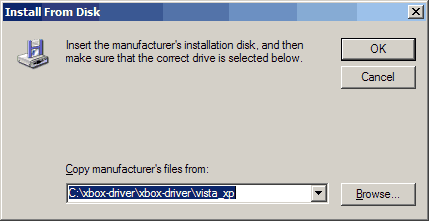 In this example is is C:\xbox-driver\Xbox360_Mod_XP\vista_xp A little redundant but that’s okay. You can verify the location by click on the Browse button and finding the extracted files. Once everything is set you can click the OK button. 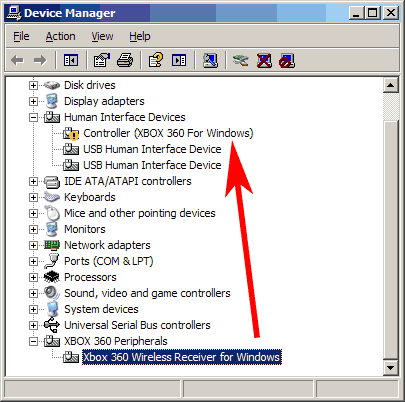 If you have the location path entered in correctly you will see the following window indicating it has found out Xbox 360 Wireless Receiver for Windows. Do not worry about the digitally signed warning. This is due to the .inf modification. Click next to continue. Drive installation successful. You may click on finish to continue. Testing out the Xbox 360 china receiver with a controller. The picture above shows a succesful installation of the Microsoft Xbox 360 receiver driver on Windows XP. Now the next part is you probably want to actually USE your controller now don’t you? Lets begin with testing out your newly installed receiver. 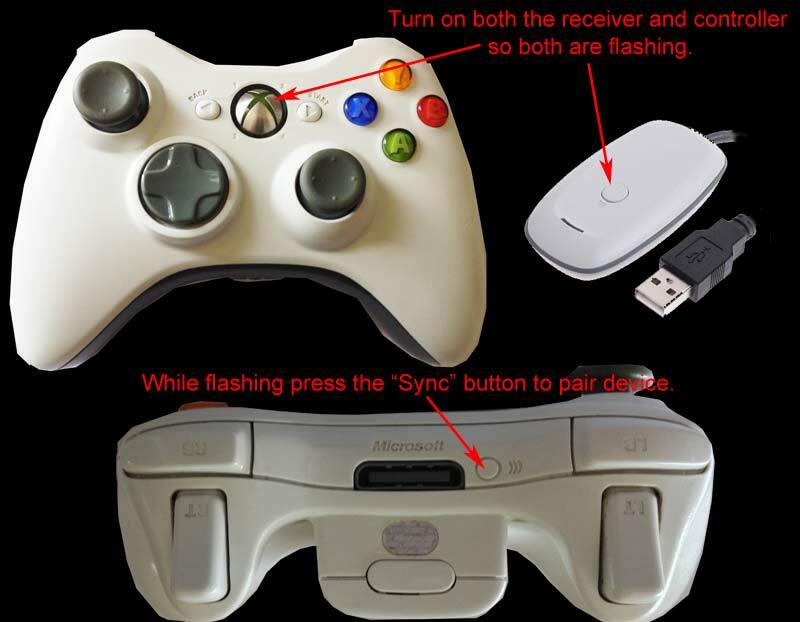 Syncing the Xbox 360 controller to your china receiver. The steps here will seem really simple for people which have owned an Xbox 360 however when looking at a lot of forums this is also the most overlooked step. Resulting in people thinking that they got a bad receiver when in all reality it is perfectly fine! Turn on your Xbox 360 Wireless Controller. It should have all four corners of the controller flashing indicating that it’s on but it cannot find a device to connect to. Press the button on the wireless receiver and it will begin flashing. 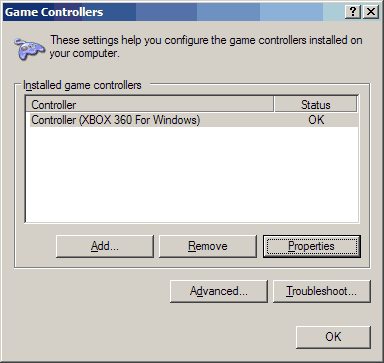 Upon syncing with your receiver windows XP will go to work detecting your newly found Xbox controller and assigning it as a Generic HID Controller. 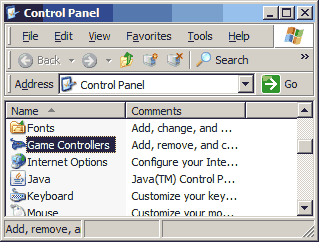 You could either select start and run and type in joy.cpl to open up the joystick panel. Or you could click on start, settings, control panel, and finally click on Game Controllers to access the properties of your new joystick/controller. You can now see that your controller has been detected in windows XP, to verify that all buttons and controls work. Click the properties button. 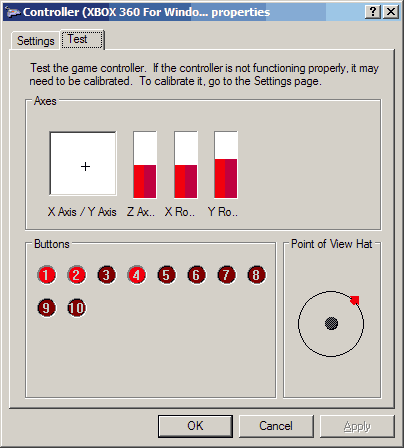 You should be able to press all of the buttons on your controller , move the d-pad around, and work with your hats. We have come to the end of this guide. We hope that you find this useful. All screenshots were recorded off of a live XP test box for authenticity. If you have any comments feel free to leave it in the comments below. China receivers do not work with the Xbox One Controller. More details here. Came to this web-page by accident and looking for the Windows 10 installation tutorial? Click here! If you want to know more about Android OS/Ouya connectivity with these Xbox Receiver adapters then click here or the picture above it has been moved to its own blog entry. Are you trying to use Linux like a Raspberry Pi to get your game on? Click here. Do you have an older operating system like Windows 7? This archived blog article may help you! Want to know some games we liked playing on this receiver? Click here for a brief list of games that work with controllers on PC. Sorry, but there’s no Download on the icon. Can you reupload please? Apologies for that. I forgot to link the blog entry to the archive. It is fixed now. Give it a shot!